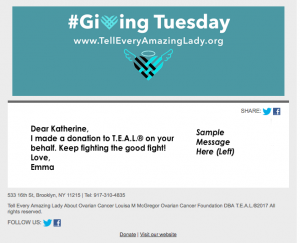 During September, which is National Ovarian Cancer Awareness Month, T.E.A.L.® partners with local businesses and organizations to turn New York City and beyond teal to spread awareness about Ovarian Cancer. 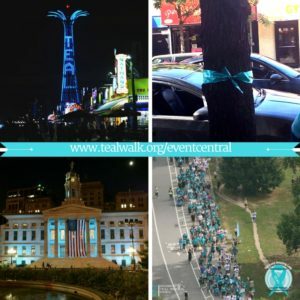 The goals of this campaign are to spread awareness of the signs, symptoms, and risk factors of Ovarian Cancer, to educate communities about the importance of early detection, to provide support to Ovarian Cancer survivors, and to generate funds for further research to find a cure and a screening test for this disease. In additional to locally based awareness endeavors, T.E.A.L.®’s September Awareness Campaign continues to grow each year. 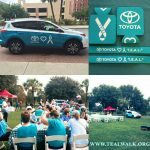 Nationally, T.E.A.L.® turns cities across the USA teal through our satellite T.E.A.L.® walks and runs and other awareness events. Globally, T.E.A.L.® spreads awareness by participating in opening bell ceremonies with global reach including the New York Stock Exchange (NYSE) (2016) and NASDAQ (2015) in addition to other global awareness activities.